I left home at 5.45 am on a cold, late November morning and arrived at London’s Stansted airport in good time for my 7.55 am flight to Belfast. 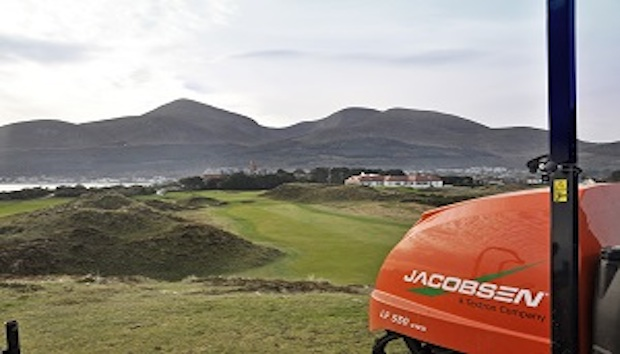 My colleague, Andy Campbell, Jacobsen’s Regional Sales Manager for Scotland and Ireland, picked me up at Belfast’s International Airport and we drove straight to The Royal County Down Golf Club, ranked the No. 1 golf course in Ireland in 2015 by Golf Digest Ireland magazine. Located in the Murlough Nature Reserve, the 36 holes of classic links stretches along the shores of Dundrum Bay, with the magnificent Mountains of Mourne offering a stunning backdrop to a round of golf. Links Manager Eamonn Crawford is the man with the huge responsibility for maintaining the courses and upholding the standards that have ensured it remains one of the most prestigious venues in world golf. He has a permanent staff of 11, supplemented by eight temporary greenkeepers in summer and three dedicated divoters. This year the number of staff will increase significantly when numerous volunteers arrive in May when the Club hosts the Irish Open. The world class, star-studded field for this year’s event includes tournament host and World number one Rory McIlroy, his compatriots Darren Clarke and Graeme McDowell, defending champion Mikko Ilonen, former World number one Lee Westwood, four-time Major-winner Ernie Els and Ryder Cup talisman, Sergio Garcia. Back in 2013, Eamonn purchased a Jacobsen Eclipse 322 and this was the first time I’d met up with him since the machine was installed. “It’s a great machine,” he said, “The quality of cut is second to none. Now in its second season it has made a significant difference to the greens on our no. 2 course, the Annesley Links. “The improvement in fuel economy is unbelievable; the smaller diesel engine uses much less fuel. In a working week, we hardly ever need to fill it up! Eamonn also purchased Jacobsen’s latest lightweight fairway mower, the Jacobsen LF550, and has been equally delighted with its performance. So much so, that he has ordered a further three machines, initially to help with the preparations for the Irish Open and for the long-term benefit of both courses. Good-byes said and it was back into Andy’s truck for the two-hour journey south to The Royal Dublin Golf Club, situated on the shores of Bull island, where we met Paddy Teeling, the Links Superintendent. Paddy has worked at Royal Dublin for 24 years and is responsible for a team of seven full-time staff and one part-timer. In 2013 he purchased his first Jacobsen GP400 and was so impressed that he purchased a second for the 2014 season. “As with all purchasing decisions, quality of cut is a huge factor. We arranged for demonstrations by all three major manufacturers and the GP400 ticked all the boxes immediately,” he said. To read the full story, head to Jacobsen’s Performance Matters Website.